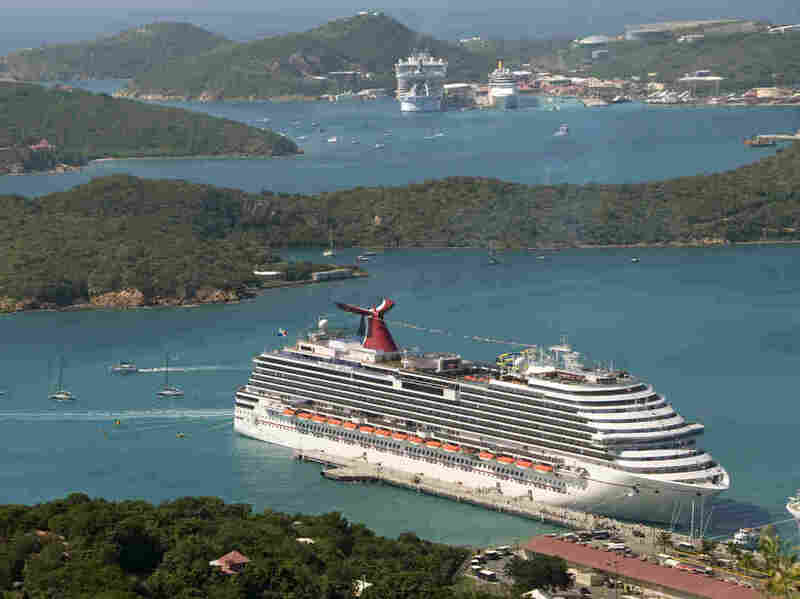 More Problems Aboard Carnival Cruise Ships : The Two-Way Passengers stranded in St. Maarten aboard the Carnival Dream are to be flown home, while Carnival Legend limps back to Tampa after a "technical issue" in one of its propulsion units. The Carnival Dream docked in St. Thomas, U.S. Virgin Islands, in December 2010. For the past month, management at Carnival Cruise Lines has been in a nearly constant state of damage control. In the past week alone, three of the cruise line's giant floating playgrounds have experienced embarrassing malfunctions that have at least inconvenienced, if not angered, many passengers. Here's the latest status report: On Saturday, Carnival Elation had to be escorted by tug because of a problem in its steering system. Since Wednesday, Carnival Dream has experienced power interruptions at the island of St. Maarten, stranding more than 4,000 passengers. And now, Carnival Legend is limping home to Tampa at reduced speed because of an issue with one of its propulsion units. All this, of course, follows by barely a month the so-called "cruise from hell" aboard the Carnival Triumph after an engine room fire left the vessel adrift in the Gulf of Mexico with 4,200 passengers aboard. Christopher Muller of Boston University's School of Hospitality tells CNN that the latest wave of issues at Carnival appear to be a management problem. "They are doing something wrong with preventative maintenance," he says. "Carnival has so many working ships that to say the fleet is in distress is maybe a little bit broad, but clearly something is not right." Carnival has blamed the problems aboard the Carnival Dream, docked in St. Maarten, on a malfunction that occurred in the ship's emergency diesel generator during a routine safety test. "At no time did the ship lose power, and the ship's propulsion systems and primary power sources were not impacted," Carnival said on its website. "However, for a period of time last night, there were interruptions to the elevators and restroom services. Toilets and elevators are currently working, and have been since about 12:30 a.m."
On Friday, the cruise company announced that 12 commercial planes would take the Carnival Dream's 4,363 passengers back to Orlando — the closest major airport. The Carnival Legend's problems, though at sea not in port, appear to be more in the way of an inconvenience. One of the ship's two Azipods, a directional propulsion unit, was experiencing an unspecified "technical issue" that has forced the ship to reduce its speed. Even before the latest problems, questions have been raised about the cruise industry in general and specifically Carnival, the largest line in the industry. Carnival's share price is down 2.3 percent and the company says it expects net revenue yields to be flat this year, versus an earlier forecast that they would rise 1 percent to 2 percent, Reuters reports. The cruise line cites weakness in Europe and pricing promotions. But as the news agency notes: "Carnival, which operates lines including Holland America, Costa and its namesake line, is grappling with a series of recent headline-grabbing mishaps involving its ships that have dented demand for its vacations."